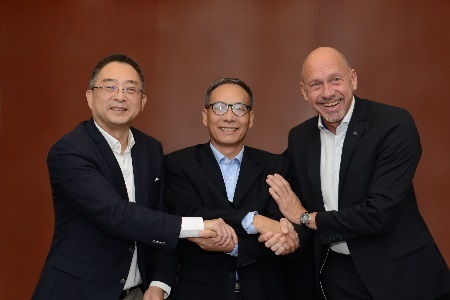 Beijing Enterprises Industrial Environmental Solutions Limited (BEIES) has entered into partnership with Royal HaskoningDHV of the Netherlands and Century 3 (Shanghai) for the delivery of the sustainable Nereda wastewater treatment technology into China. The move to introduce Nereda technology into China represents an exciting opportunity for the country. BEIES can now install this state-of-the-art technology in its wastewater treatment projects across China, ensuring excellent and sustainable wastewater treatment while effectively expanding its installations’ capacity. Nereda is the biological wastewater treatment technology that purifies water based on bacteria growing into compact granules. The technology was invented by the Delft University of Technology in the Netherlands and developed in a unique public-private partnership between the University, the Dutch Foundation for Applied Water Research (STOWA), the Dutch Water Authorities and Royal HaskoningDHV. Currently there are 25 full-scale plants in operation and 64 under construction or design worldwide. For more information, visit www.royalhaskoningdhv.com/nereda. Royal HaskoningDHV is an independent company delivering engineering, consultancy and project management services since 1881. We have almost 6,000 professionals operating from across the world who are eager to innovate and co-create with clients and partners to have a positive impact on people, our living environment and the economy. More and more we connect the digital with the physical world. Together with clients and partners, we use data and algorithms to solve new challenges and prevent problems. We help our clients in their digital transformation and we support their business with better and faster execution of their ambitions. Enhancing society together! For more information, visit www.royalhaskoningdhv.com. Beijing Enterprises Industrial Environmental Solutions Limited (BEIES) is a holding subsidiary of Beijing Enterprises Water Group Limited (BEWG). BEIES provides municipal and industrial customers with advanced solutions in the water and wastewater, waste gas, VOC, solid waste and hazardous waste domain. By leveraging its strong capabilities in the integration of technologies, services and financing instruments, BEIES is capable and has enough capacity to apply multiple business models including consulting, finance, design and build, BOT, BOO, O&M etc. to serve the industrial and municipal customers. For more information, visit http://www.bewg.net/en/. About Century 3 (Shanghai) Inc.
Century 3 (Shanghai) Inc. is a leading technology, engineering, and project management company in China. Established in 2004 with headquarters in Shanghai, Century 3 provides reliable solutions to industrial and commercial clients worldwide with a full range of integrated engineering, construction, Jianli and trading services with Chinese government issued licenses. Century 3 takes pride in delivering the best possible value with the state-of-the-art technologies. In addition to its China operations, access to internal and external resources based in North America, Europe, and South East Asia gives Century 3 a pool of experience capable of responding to any client need. Century 3 has been firmly established as a benchmark for excellence in engineering and construction services in China. For more information, visit www.century3inc.cn. DHV (Beijing) Environmental Engineering Co., Ltd. (BEEC), now a wholly owned subsidiary of Century 3 (Shanghai) Inc., has been actively involved in the design/engineering and build for water supply, wastewater treatment, and environmental protection facilities since its foundation in 2000. Its business scope covers the entire engineering, equipment supply/delivery, system integration and contracting etc. in the above-mentioned fields. Advanced and innovative technologies are the basis for BEEC’s successful development in China. In the field of water/wastewater treatment, BEEC holds multiple cutting-edge technologies and equipment, which have been essential for the company to achieve successes in Chinese market. BEEC is extensively engaged in both municipal and industrial sectors with diversified clients (private/public, domestic/international) and delivered numerous projects both at home and abroad. For more information, visit www.dhv-beec.com.